Even in our tiny cottage back home in Columbus, Victoria and I would disagree once in a while and sometimes even have full blown arguments. Every couple does, or every healthy couple should. The reason, in my opinion, that relationships work is not because the individuals are so much alike, but because their differences compliment and challenge one another on a regular basis. But in the cozy confines of our wheeled tin hut, there are very few times that we are truly alone. Come to think of it, we are really only alone when we’re crammed the tiny bathroom. Twenty-four hours, seven days a week are spent together planning, exploring or reporting. Heads can get heated, feeling can get hurt, and sometimes it feels more like we’re just business partners than best friends. We don’t want to make too big a deal of these date nights as they are about relaxation. These nights might be weekly, they may be twice weekly, and we might weave our travel plans into them on occasion. So, some of them may be reported, while some might just be too boring for words – Chipotle and a bad movie perhaps, or an evening spent catching up on The Big Bang Theory. So, our first date night took us to Plymouth, Massachusetts, the supposed landing spot of the Pilgrims, Plymouth Rock and The Cabby Shack. The Shack is the purveyors of the world’s most decadent clam chowder… made with thick crème, butter and the freshest clams available. A spoon literally stands at attention in the center of the bowl, not wanting to leave its creamy center. It’s so decadent in fact, that it is spelled the way good clam chowder is supposed to be ordered – “Clam chowDAH”, and can be, and should be served in a buttery homemade bread bowl. It has been profiled on the Food Network in shows like “Guilty Pleasures” and “The Best Thing I Ever Ate,” and I have to say, without question, The Cabby Shack’s chowdah is the most fabulous clam chowder I’ve ever eaten. Especially when washed down with a delicious, Boston-brewed Harpoon IPA! Victoria still holds out that the Oyster House in Boston is her favorite. Following our shared bowl of chowder, we walked down to check out Plymouth Rock and browsed in a few stores before heading home. It was a nice, relaxing evening and a good break from our busy schedule. I look forward to some more date nights like this! 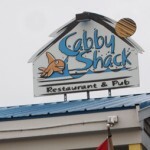 Learn more about The Cabby Shack here.